The pedestal stand style pictured below can be built and woven for you in the size and colors of your choice. 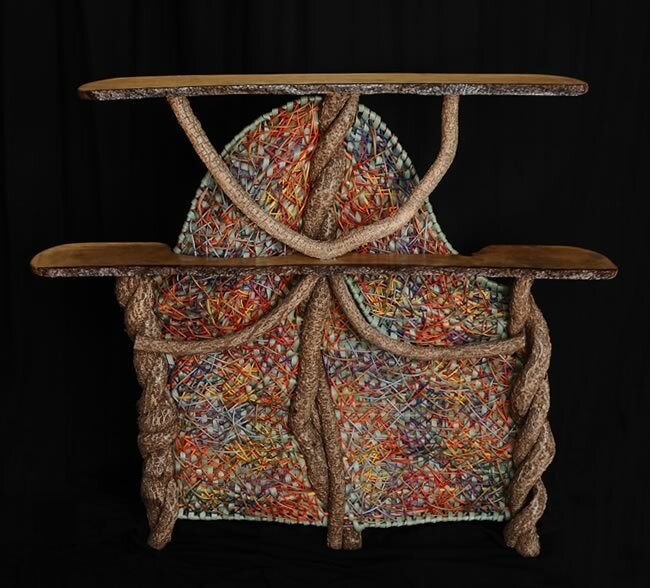 Tina welcomes commissions to custom build and custom weave pedestal stands and other furniture. Contact Tina directly to commission a custom-designed pedestal stand. H 48" W 48" D 8"
This colorful and striking piece of furniture is supported on legs made of curling pieces of bittersweet vine twisted around each other. The shelves are rough-sawn "live-edge" pine stained and then polyurethaned for durability. The look of stained glass to the woven backdrop of this pedestal stand is achieved by Tina's use of her own "Dimensional Weave" technique to interweave brightly colored reeds into a background of pastel-colored reeds. View an enlargement of the construction detail in this piece of furniture. View more construction detail.